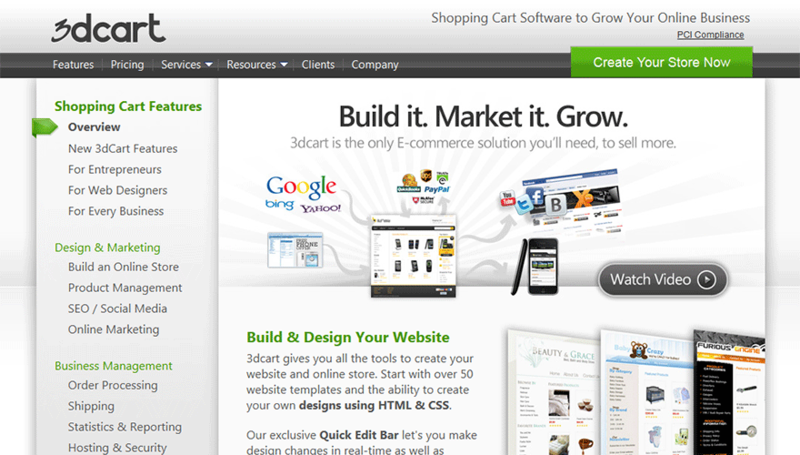 3DCart is an eCommerce software company that has been operating for more than ten years. With more than 10,000 customers worldwide, the company is well known and popular for offering low pricing and great store management features. We had a look at 3DCart’s product and were impressed with what we found. This is definitely a company to take a closer look at when you’re trying to decide on your shopping cart solution for your online business. 3DCart’s great features start with storefront design. Drag-and-drop design makes it easy to make a beautiful storefront with more than 50 pro templates and no coding knowledge required. Picnik Image Editing is integrated to make it easier to adjust and upload your images. All designs are fully customizable, and you can display customer testimonials directly on your page. 3DCart is one of the cheapest shopping cart solutions that has no transaction fees. We love their 3dzoom feature for product photos. We’d like to see 3DCart include their live chat plug-in on the cheaper price plans. The administrative features of 3DCart make it simple to take care of the details of running your online store. You can enhance your product pages with multiple views and YouTube videos, which can help customers to get a better feel for what you’re selling since they can’t see it in person. Multi-color dropdown makes it easy for customers to select the color they want and to get an idea for how an object will look in that color. You can also offer e-downloads if you want to sell virtual merchandise. Customers have the option of creating a wish list for future purchases. Manual and automated up-selling and cross-selling features are available to help customers to compare related merchandise and choose the products which fit their needs. You can also track your inventory using an advanced tool, even down to specific variations on objects such as sizes and colors. These are just a few of the many great features for managing your store and improving the shopping experience for your customers. Security features are unfortunately a little lacking in that we found no fraud prevention program and no delivery network. 3DCart is search engine optimized so that your shop will rank well on search engine rankings. You are given a number of social media marketing tools such as social commerce videos from YouTube you can embed in your product pages and a blog that allows you to keep in touch with customers. A coupon + promotions manager allows you to create special discounts to compel your customers to make purchases, and an email newsletter manager helps you to send out relevant emails to customers. There is also an affiliate program you can use for advertising. Other tools include gift certificates, free shipping offers, customizable checkout questions, and more. Five different pricing tiers are available; this is one of the more affordable services we’ve looked at. The Mini plan is the starter plan for small shops which sell up to 100 products. This plan costs $19.99 per month, or $16.00 per month if paid annually. You’re given $175.00 in advertising credits for free. The next step up is the Starter package, which costs $35.99 per month, or $30.00 per month if paid annually. This allows you to sell up to 500 products and comes with additional advertising credits. Gold membership costs $49.99 per month, or $42.00 per month if paid annually, and allows you to sell up to 1,000 products. The Professional plan costs $99.99 per month, or $84.00 per month with the annual pay discount. This plan lets you sell unlimited products. The Power Plan also allows you to sell unlimited products at $129.99 per month, or $110.00 per month if paid annually. You get more tools for selling at the higher levels than you do at the lower levels. You also don’t get LiveChat unless you are a Gold member or higher, and the QuickBook Plugins are only available at the top two tiers. You can try the service free for 15 days. Customer service options are good on the whole, although lacking in a couple areas. While you can reach an agent anytime, 24/7, via phone or email, you won’t find a Frequently Asked Questions page on the site, and the user manual seems to be out of date. There is however a knowledge base, video tutorials, a forum and a company blog which can provide further information on the product. All in all, 3DCart is a great eCommerce solution that provides plenty of tools for marketing, product and store management, and more. The only drawbacks were in the lack of up to date documentation and security, as well as the fact that despite the low prices for basic service, some features are not available unless you pay more per month. Whether or not 3DCart is the best provider for you will depend on your budget and which tools you need to run your store; TopFiveAdvisor gives 3DCart a 9/10.